Check pipes and plumbing for visible leaks and cracks. Look for water spots below plumbing fixtures as this is often a sign of leaking pipes. If you find a leak or discover water damage, contact a water damage restoration professional immediately. Even a small, superficial crack in your home’s ceiling or roof can turn into a potential disaster after a tremor. 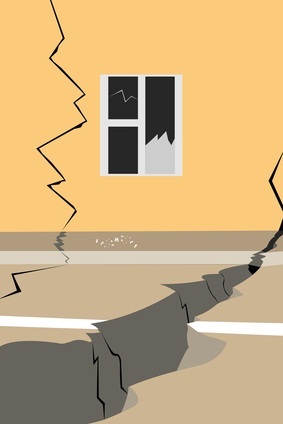 Check your property’s foundation for medium to severe cracks and have them fixed by a certified technician. This is something that is best left to trained professionals. If you know for a fact that you have an electrical wiring or gas connection problem or can see physical signs of damage, contact a technician that can repair the problem for you. These pose potential fire risks. Heavy home appliances can fall over during an earthquake, causing major damage or even a fire in certain cases. Secure your water heater, refrigerator, furnace and other gas appliances by strapping them to wall studs or bolting them to the floor. Home owner’s insurance only covers certain disasters, like water damage and fire damage. If you live an area prone to tremors like California, we highly recommend the purchase of supplemental earthquake insurance. Our technicians at 911 Restoration have the expertise as well as the equipment to maintain your home before, during and after a disaster like an earthquake. We can help after broken water lines, water heater leaks and even roof and ceiling collapses, so call us today and let our team take care of you and your family!